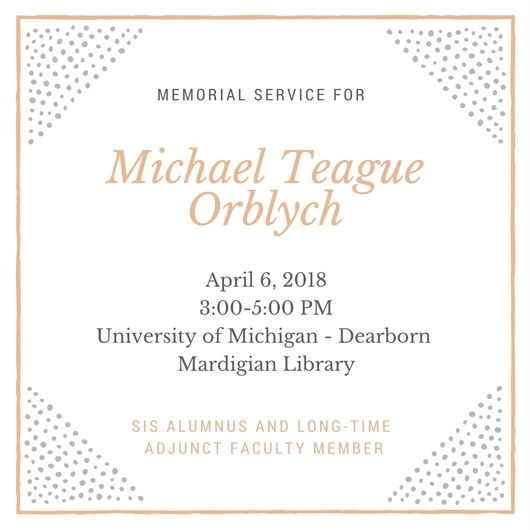 On Friday, April 6, from 3:00 to 5:00 p.m., a memorial will be held to celebrate the life of Michael (Teague) Orblych, Research Education Coordinator and Social Sciences Librarian at the University of Michigan-Dearborn’s Mardigian Library. The memorial will be held in the Berkowitz Gallery, 3rd floor Mardigian Library. Are you interested in sharing a memory or short story about Teague at the memorial? If so, contact either Nadine Anderson (nfanders@umich.edu) or Jamie Wraight (jwraight@umich.edu). If you cannot attend or don’t wish to speak, a memory book is being compiled for the family. Please send your favorite thoughts, stories, or memories to Nadine or Jamie. Teague received his Bachelor in General Studies at the University of Michigan in 1991 and his Master of Library and Information Science in 1999 from Wayne State University. He worked as an Assistant Librarian at the University of Detroit Mercy from 2000 to 2001. Teague joined the Mardigian library in 2001 as an Assistant Librarian and worked his way to Librarian in 2014. During his 17 years at the Mardigian Library, Teague impacted many students with his passion and dedication. As our Social Sciences Librarian, he was passionate about teaching and supporting students. As our Research Education Coordinator, he provided valuable leadership, expertise, and experience. He was known in the library and across campus as a respected collaborator in teaching and research, as well as a valuable member of our community. Teague’s passion for information literacy along with his publications, presentations, and leadership enriched the field of academic librarianship. Most of all, we will remember him as a great person who made us laugh. We are establishing an endowed scholarship in Teague’s memory for UM-Dearborn students. To contribute, contact Eva Gogola by email at egronows@umich.edu or by phone at 313-593-5495. Please share this with anyone you feel may wish to attend the memorial, share a memory, or contribute to the scholarship.